If there is one thing I HATE about summer, it is all the bugs. I grew up in the country and am no stranger to bugs but that doesn't mean that I love them. My daughter, who is my eldest, LOVES bugs, frogs, worms and all those nasty things and it seriously grosses me out. Today she came in the house with the biggest toad I have ever seen...she played with that poor thing for quite a while and it wasn't until I told her to release him, that she did. Yuck. One of the most dreaded pests for me are mosquitoes. Something about that super high-pitched buzzing right in my ear gets me so aggravated. Whenever I see a mosquito anywhere in my house, I just have to kill it. This summer, I have noticed that we have a ton of mosquitoes but thankfully, they don't show up badly until dusk. However, that is the time that I like to go outside and water my plants, enjoy the summer evening with my summer and sit around a campfire. Those pesky mosquitoes are the main things that drive us back into the house though...I hate them!! This award-winning product has been recognized by leading entomologists and outdoor writers as the solution to making outdoor activities enjoyable. Today, Thermacell is sold in 23 countries in North America, Europe, Africa, and Australia. Like I said before, mosquitoes are our biggest pest concern when it comes to bugs. Not only are they annoying by flying right around your head but they also create some of the worst bites. I hate it when I have to retreat to the house because I am getting eaten alive. 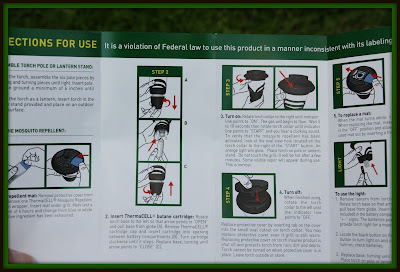 Well, for this review I was sent a ThermaCELL Mosquito Repellent Backyard Torch to try out. Immediately, I was intrigued by the 15'x15' badge on the front of the packaging...would it really keep mosquitoes away in that large of an area? I was definitely curious. Upon opening the box, I was relieved to see that assembly was minimal. I had the entire torch completely assembled within several minutes. I love that this torch not only comes with metal torch posts, but also comes with a table-top base so you can use it on your picnic table. 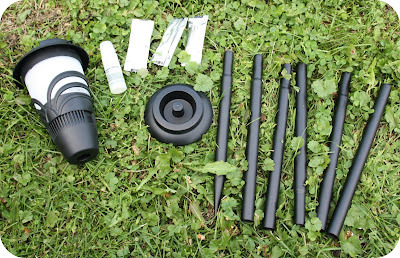 This torch comes with a small container of butane, three mosquito repellent mats, an easy-to-assemble pole, a lantern and a base for table top use. Ok, so the "power" of this mosquito repellent torch is all in that little blue pad I am holding. You simply remove it from the wrapper and insert it under the grill on the top of the torch. Once you insert the butane cartridge to the underside of the torch, it heats up the pad (you can turn the torch on and off by twisting the top) and emits a repellent that lasts up to 4 hours. 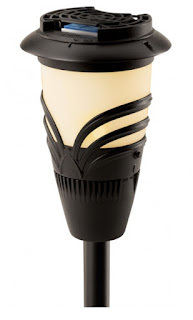 This torch also comes with a cover so you can leave your torch in place and it won't become useless after being in the rain or exposed to dirt. I love that I can leave it installed and just use it as I need it. I didn't find the light to be very bright and probably won't be using that feature. It does take AAA batteries and if I don't need to use those, I won't. As far as effectiveness goes, I will say that it does work but I didn't notice a huge difference in the mosquitoes disappearing. Maybe it is because I didn't leave it on long enough, but I think after having it on for 10 minutes it should work relatively well. Maybe we just have a large amount of mosquitoes around our house too, or I need more than one torch to "accommodate" the number of mosquitoes that we do have. 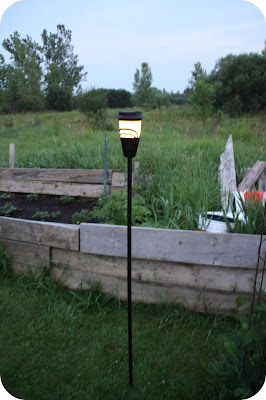 Either way, I still love this torch--the way it looks, how easy it is to use, and the claim that it repels mosquitoes up to 15'. I am definitely going to keep using it though and cannot wait to see how it works throughout the remainder of this summer. You can find this and other mosquito repellent products at ThermaCELL's website. 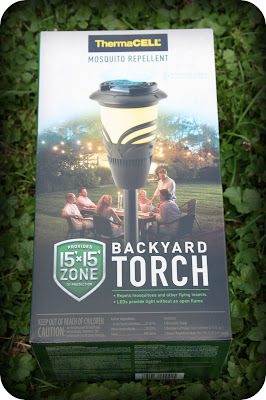 This particular torch retails for $34.99 and can be purchased directly from ThermaCELL. 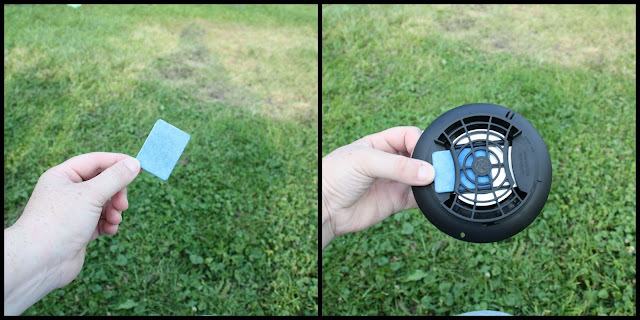 Check it out today and see how well it can provide you with a mosquito-free summer! Disclaimer: I received no monetary compensation for this post. I did receive free product for review purposes. All quotes and stock photos are from the ThermaCELL website and email.All thoughts and opinions are 100% mine.